Filed to: puppies!Filed to: puppies! It's a debate that pops up every now and then on pretty much any car community; Manual vs. Dual-clutch/automated gearboxes. And everyone is just wrong. The usual argument on the row-your-own side consists of statements like "You have more control of the car" or "if your brakes go out you can just downshift." But let's be honest: You're not feathering the clutch to precisely regulate power when you're going around a curve. Automatics engine brake just fine, as anyone who has ever hit the wrong paddle will attest. And of course, the discrepancy in efficiency that used to result from a manual transmission is now not only absent, but inverted. As for the DCT groupies, you'll see endless listings of milisecond shift time advantages, half-second lap time improvements, and other such completely irrelevant statistics. There is a very small subset of Enthusiastica Automotiva that is actually going to benefit from faster shift times when they're blazin' it around the track. I have never been in my car and thought "If only that shift had happened faster!" Now, granted, when you want absolute, earth-shearing levels of acceleration from a dig, Dual Clutch is the way to go. The robo-clutch can put precisely the right amount of power down, and the lightning-quick shifts mean you don't lose momentum during a change. The point I'm getting to is, we need to stop trying to justify our chosen linkage with numbers and facts. It's not about that. It's about fun. Enjoyment. Connection. 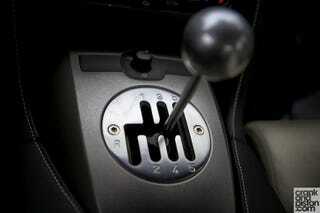 I drive a traditional manual because, for me, the act of changing gears is enjoyable. It makes me feel more a part of the car's operation, and I love the feeling you get from a flawless heel-toe downshift. On the other hand, if you like the ability to not worry about shifting all the time, but take over when you'd like and not have the pudginess of a fluid coupling muddying up your driveline, DCT's are great. I get it. I do. Manuals are a dying breed. We thought, hoped for a while that they would survive because no sports car could be sold without one, but then DCT's came along and we lost that comfort. Suddenly the cars available with a stick were burning away like flashpaper in the breeze. Audi, BMW, Porsche, Nissan, Lamborghini, Ferrari... all were coming out with more and more cars that were not available with a manual. We feel obligated to defeat this newfound menace, to preserve our way of life. The thing is, though, we don't matter. The people who care about lap times, driving fidelity, shift times, launch control, etc... don't matter. The trophy wife who doesn't know that her RS5 doesn't have the same automatic transmission as her Lexus RX? She matters. Her, and people like her, are what drive car design trends. Not us enthusiasts screaming out into the void.